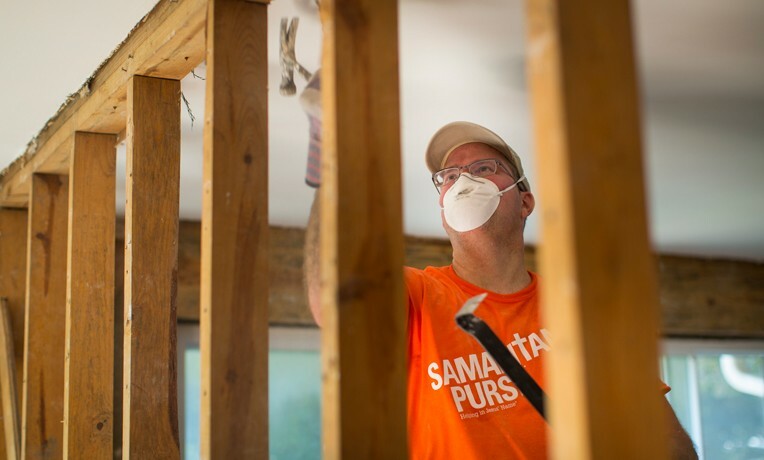 Samaritan’s Purse volunteer teams continue to recover possessions ravaged by Northern California fires. And God is receiving the glory. 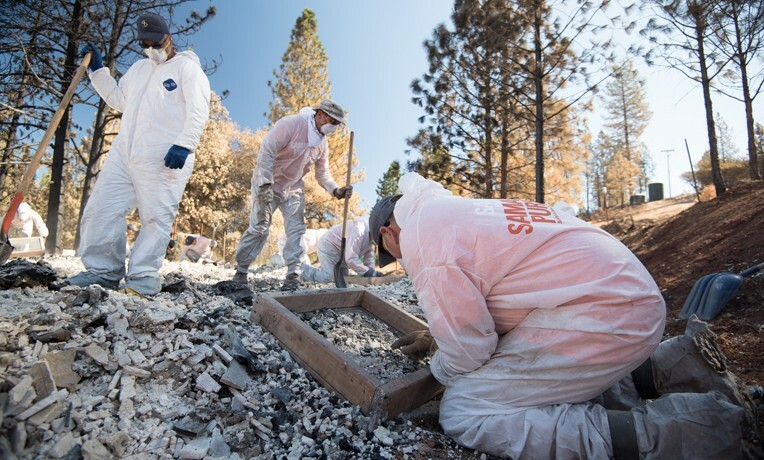 Just like the miners of yesteryear meticulously panned for gold during the California Gold Rush, Samaritan’s Purse volunteers are today painstakingly sifting through ash helping homeowners recover precious possessions lost during the recent deadly wildfires in northern California. But in the case of these volunteers, their work is not for self-profit but instead selfless service done in Jesus’ Name. To date, more than 350 homeowners—some in remote locations—have requested assistance from Samaritan’s Purse. More volunteers are still needed to tackle and fulfill these requests. We have two disaster relief units on the ground overseeing the work. Our Butte Fire unit is based at San Andreas Community Covenant Church in Calaveras County. Our Valley Fire unit is stationed at Harvest Fellowship in Clearlake in Lake County. Sifting through ashes is a tedious but rewarding process. Many homeowners are overjoyed when our volunteers find precious items they’d thought were lost forever. In both locales, volunteer teams continue to disperse throughout burnt neighborhoods. They’ve battled hot and dry conditions as they continue to come alongside homeowners and demonstrate compassion, delicately combing through the rubble for items that survived the flames. Their tireless efforts have not been in vain. As possessions are discovered, shouts of glee and words of praise echo heavenward. Late last week, volunteers in Clearlake—the area affected by the Valley Fire—recovered Special Olympic medals that one homeowner’s son had won over the years. Her son has Down’s Syndrome and the medals are precious to the family. In the same vicinity, a different team searching through charred debris found a wedding set and a 20-year anniversary ring belonging to one homeowner. The same is true in San Andreas, which was devastated by the Butte Fire. 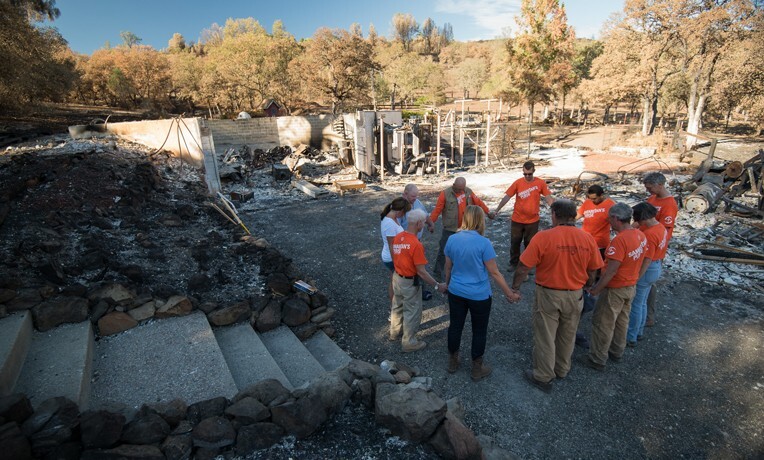 Praying with homeowners in the wake of the Valley Fire. John thought the ring was lost forever. As a team of Samaritan’s Purse volunteers helped him sift through the ashes, they found the ring! That certainly rang true last week, when our volunteers were checking out potential work orders in one area. That opened the door for a conversation with a neighbor. Suzanne expressed her thanks for what Samaritan’s Purse was doing. When asked if volunteers could do anything for her, Suzanne responded that she and her husband were in their 70s and were getting tired, so the team leader suggested that they sign up for help. She did. Within five minutes, another Samaritan’s Purse team called this coordinator to say that a homeowner hadn’t showed up at their site, so he directed them to go instead to Suzanne’s home. By the end of the day, not only had these volunteers helped Suzanne and her husband recover items, they also witnessed the couple committing their lives to Jesus Christ. Please continue to pray for Samaritan’s Purse volunteers in this important recovery effort, and as they partner with crisis-trained Billy Graham Rapid Response Team chaplains who are also there offering spiritual and emotional care to homeowners.